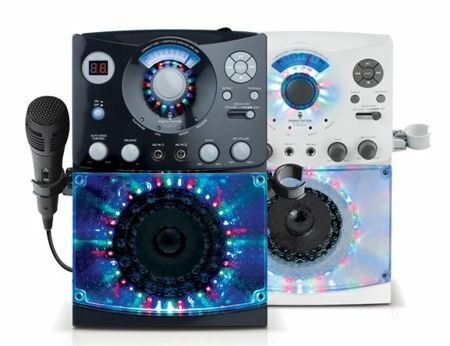 With the Singing Machine SML385 being the most recent addition to their range of at-home entertainment products, those who are interested will be able to pick it up from Wal-Mart stores in the U.S. for $49.97 a pop. At that price point, which is a whole lot more affordable than spending the evening out at a fancy restaurant, the SML385 certainly starts to look as though it offers plenty of value for money. In fact, it will come with a top loading CD+G player, as well as a pair of microphone jacks so that you can belt out duets. Not only that, to spice things up even further, the SML385 is touted to arrive with disco lights in order to bring up your performance by a few notches, and the built-in speaker will be able to deliver huge sound to your party while doubling up as a voice projector for really large groups. Using the SML385 is a snap – all that you need to do is to plug it into a power source, place one of your favorite CD+Gs and hook it up to your TV or monitor through the included RCA cable so that you can check out the scrolling lyrics on screen. It takes a matter of seconds for the music to start playing through the speaker as the lyrics make their way across the monitor screen for easy viewing, so that you can belt out those greatest hits without a hitch.